With Photo Calendar Creator, you can make beautiful calendars in any language of the world. To add a new language, open the Main tab and select the Language Editor option under Calendar language. 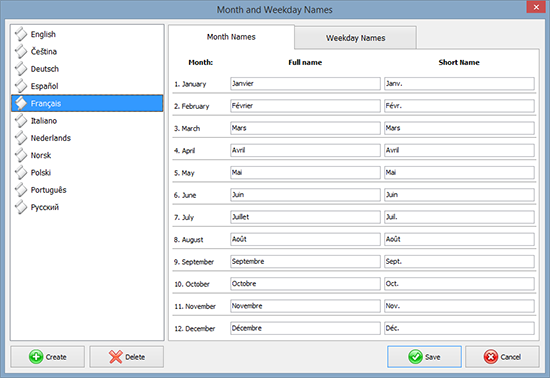 By default, the editor supports calendar creation in English, French, German, Spanish, Portuguese, Italian, Russian, Dutch, Norwegian, Czech, and Polish. Each language has different layout and text style options available. If necessary, you also have the option of using two calendar languages for month headers simultaneously. Photo Calendar Creator has a built-in language editor which allows you to add any language you wish.